Emmet is a character in the Grand Theft Auto series who appears as a minor character in Grand Theft Auto: San Andreas (set in 1992). He is a small time arms dealer based in Willowfield, Los Santos and a member of the Seville Boulevard Families. 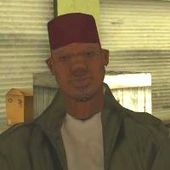 He is voiced by Eugene Jeter Jr..
Emmet, presumably born in the poorer neighborhoods in Los Santos, became a member of the Seville Boulevard Families at an unknown time. He opened his gun dealing business, Emmet's, at some point prior to 1962. He begins to sell weapons to the Seville Boulevard Families and their allies, the Grove Street Families and Temple Drive Families, although he begins to lose business to Ammu-Nation, who open opposite his business, partly to the inferior quality of weaponry. He is known to the Johnson family, in particular Beverly Johnson and three of her sons, Sweet, Carl and Brian, as well as Grove Street Families gangsters Big Smoke and Ryder. After his return from Liberty City, Carl suggests visiting Emmet to see what guns he has in stock for their war with the Ballas. Carl and Big Smoke go to visit him, with Emmet briefly thinking that Carl was his deceased brother Brian. He passes on his condolences for the recently deceased Beverly and later tells him that she would be proud of him. He then tells the two they can take anything they like. Smoke looks through Emmet's guns but criticises their age, before finding a pistol. Carl and Smoke then shoot at various glass bottle targets Emmet had lined up, shooting them, before Carl shoots an old car in the fuel cap, causing it to explode. Emmet, happy with their appearance, reminds them not to say where they got the guns from, suggesting he does not hold a licence to sell guns. Emmet continues to leave a pistol for Carl in his yard, which he does not charge for. Ryder later visits Emmet and leaves with an AK-47, which is later used to fend off the police. CJ mockingly calls the rifle an antique due to its old age, and at one point the gun even jams. Emmet speaks in a heavy Southern accent, implying he was born, or at least his parents, are from the Southern United States. Emmet's comment "But remember this, you didn't get 'em from me" suggests that he does not hold a license to sell guns, a likely reason for his aging weapons stock. However, even the clerk in Ammu-Nation says this when you buy a weapon. It's likely a joke, or just hinting at the player's reckless use of said firearms. Ryder mentions Emmet during the mission Home Invasion, criticizing the age of his weapons in comparison to those he and Carl Johnson plan to steal from Colonel Fuhrberger. Ryder also mentions Emmet during the mission Reuniting the Families, having purchased a gun for use in emergencies. Carl then uses the gun to help fend off the police. The gun later jams but Carl, Ryder, Big Smoke and Sweet manage to escape. This page was last modified on 15 March 2014, at 16:11.